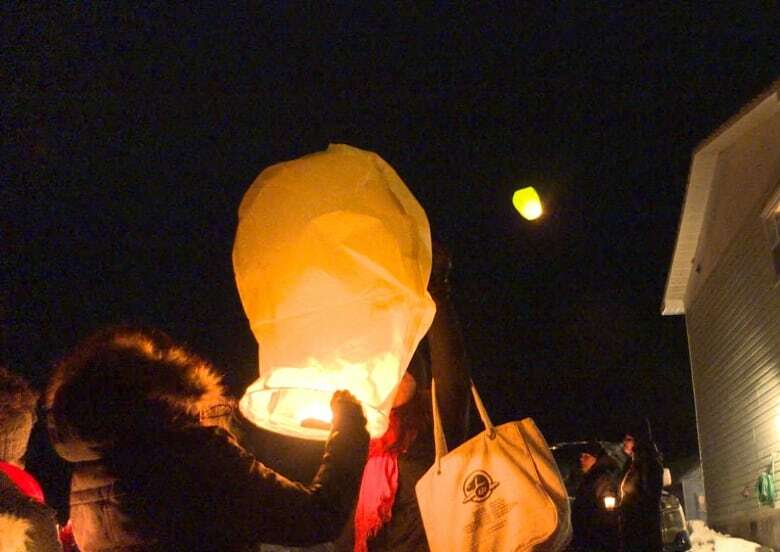 Floating lanterns soared into the sky above Conne River Monday night, as family and friends of Chantel John came together for a vigil in her memory. The community filled the front garden of John's parents' home for the service, about 100 metres away from the scene police continue to investigate. John, 28, was killed last week and the RCMP has charged 35-year-old Kirk Keeping with first-degree murder. 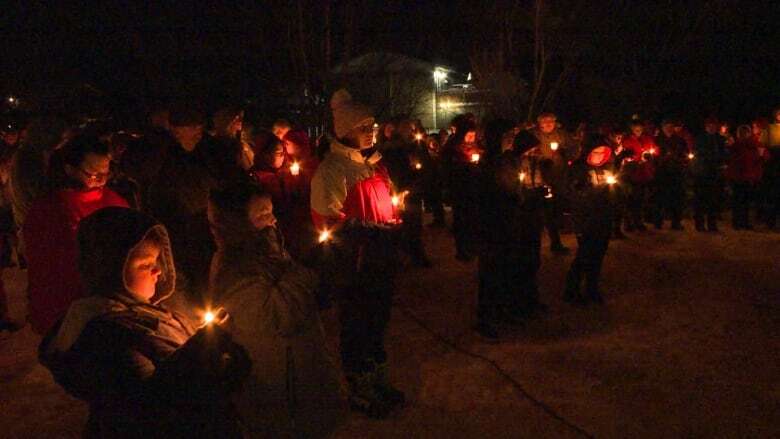 "As we release our lanterns, may they soar high to where she rests, and burn ever so brightly, as she did," Melissa Organ, who helped the John family organize the event, told the crowd. 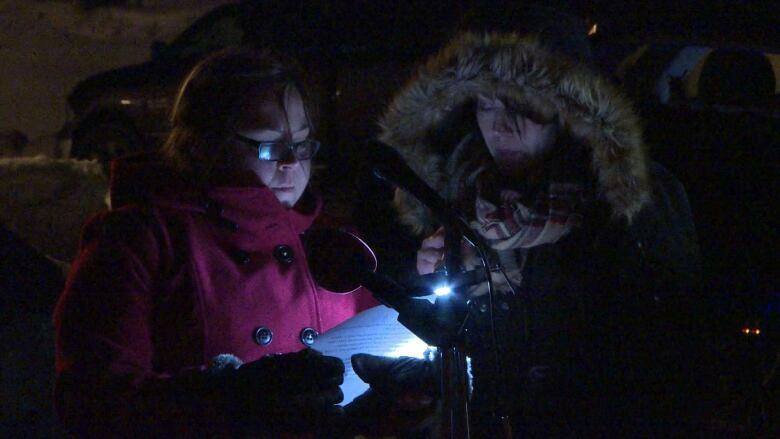 "Let tonight remain a memory for all of us, but also be a reminder of how precious life is." 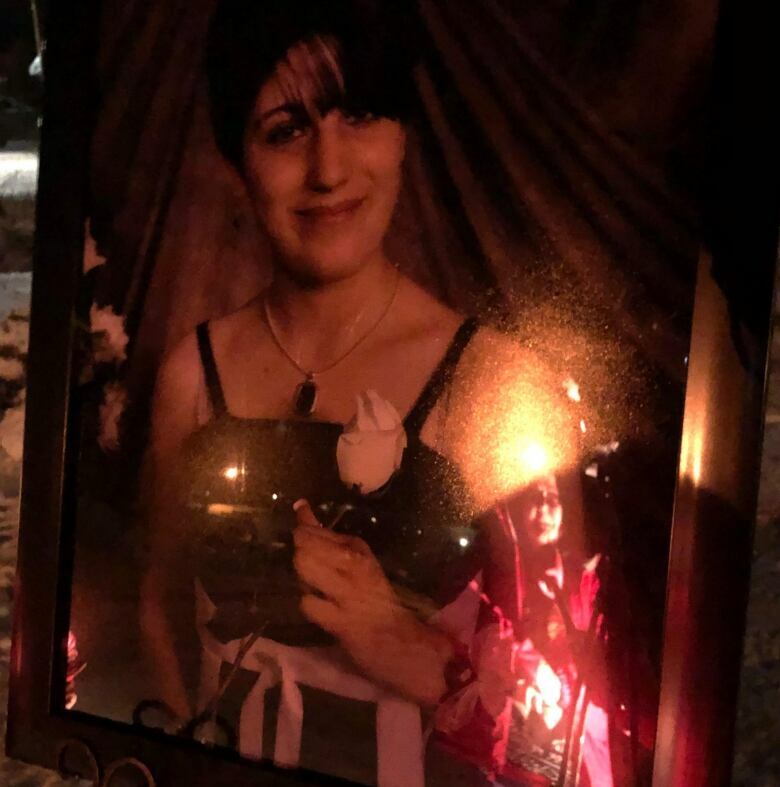 Organ said John's family are hoping to not only honour her and her life, but to raise awareness of missing and murdered Indigenous women and girls, as well as intimate-partner violence. "The community is like a big family, so it hit everybody literally in their home," she said. "I think everyone is having a really difficult time." They're also hoping the event will begin the healing process for John's family and for the community of Conne River, she said. Sagamaw Mi'sel Joe, chief of the Miawpukek First Nation, asked the crowd to donate red clothing to the band office. It will be hung in trees and on signs along the Conne River Road into the First Nation ahead of John's wake and funeral. "When Chantel comes home, we want her to pass through that corridor of red dresses, and to always remind us of what we've lost," he said. "And what we gained. We gained a family coming together to look after each other and love each other, and let her passing be that legacy of bringing us all together." Organ said members of the community are trying to support one another as best as they can and that the local family centre has provided counselling and a place of respite for the community. "This is not something our community have ever experienced, thank God. It's new to us. It's been horrific," she said. "We've all seen it on TV, but it's never come close to home. So it's real, it can and it did happen, and we're hoping to do our part to raise awareness in this community," Organ said. Jean Stride was a close friend of John's since she was a teenager. Stride said she was impressed by the turnout at Monday's vigil. "I think it's amazing … it shows how much she meant to everyone," she said. "Chantel was my best friend, she was everything." Stride said John had a big heart, and the two used to rescue animals together. "Stray cats, cats that nobody wanted anymore, we'd take them, we'd find homes for them," she said. "She loved animals … she thought everything deserved love, we both did and I think that's what brought us so close." Stride and John would drive around together listening to music and singing, sharing their favourite songs with one another. "One song she sent to me a day before everything happened, and I'll never forget it," Stride said. "It was a song called Be Good to Her. She helped me through my difficult times and she told me that song was made for us and that one day we will find happiness. I just hope she found hers." Above all, Stride said she wants to see justice for her best friend. "She was just taken, it's not fair."